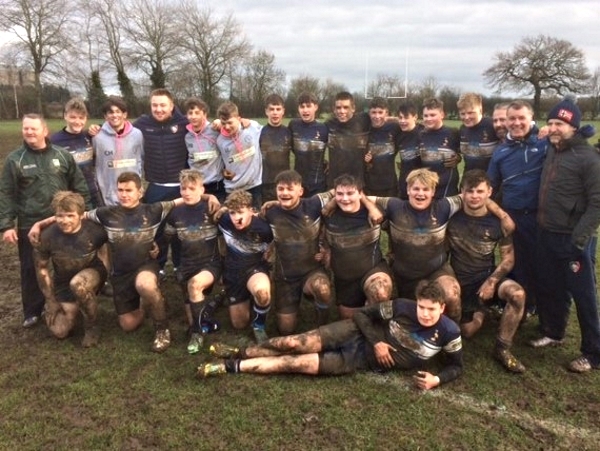 Newark's under 16's traveled to Scunthorpe for the final of the Under 16's NLD Competition for a tough but long awaited game against the winners of the other group, Derby. The same 2 sides had met in the final 3 years ago and had played each other on a few occasions since so Newark had an idea of what to expect from their opposition. Newark had a chance to strike first with an early penalty almost in front of the Derby posts but it was pushed just wide by Ben Lee. Both sides then traded possession and territory as the physical battle in the forwards was played out. Oddly Newark seemed however to get the wrong side of some of the official's marginal decisions which afforded Derby some easy yards from the resulting awarded penalties. It was from one of these resulting line outs they scored their first try after a kick over a ruck on Newark's 22 into the space behind, and the ball bounced kindly into the hands of the chasing Derby for them to fall over the line. Their second try was almost a carbon copy a few minutes later and Newark now trailed by 10 points. Newark reacted well and were soon back in the Derby half putting them under pressure. Some excellent line out and mauling then drove them into the Derby 22 and after some great ball retention George Coen forced his way over the line for a well deserved score. In the second half Newark's pack began to dominate and they kept Derby mainly pinned in their own half. Derby tried to kick their way out a few times but Newark's backs returned with interest setting up platforms for the pack again. The equalising score came from Adam Bailey after some great pick and drives off several rucks. Soon afterwards Ryan Turlukowsky powered over from a few metres out after another period of pressure that Derby could not deal with, and finally minutes before the end Josh White characteristically bulldozed his way through a tired Derby defence to score Newark's 4th and final try. This one was converted by Ben Lee and settled the contest at 22 points to 10, as there was only time for one more play from the restart. Newark, having scored 17 unanswered points in a dominant second half display, were worthy winners, due mainly to a great effort from the pack, the stand out guy and Man of the Match was Callum Heyes (younger brother of Leicester Tiger and England U20, Joe, best water boy we have ever had on the day ). Captain, George Coen, was delighted to receive the trophy in front of a large and joyous group of travelling support of family, friends and other club members who had made the trip up. In a strange twist it was 11 years ago that the team's Head Coach, Danny Coen, was Captain of the Newark side that beat Scunthorpe at Derby in the Senior NLD Cup fixture that year ..... and worth a mention that 6 of this team have been together since starting at the Club's Multi-Sports aged just 6 years old.